CH. Elvis finished his Championship in 2 months in limited showing with BOB and Grp 1 and 3 placements. 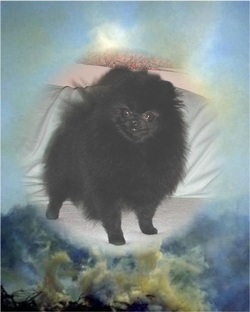 His bloodlines are from the famous Bonner Pomeranians and are rare even among the show bloodlines seen today. His tiny 3 1/4 lb. body is solid and as short-backed as I have ever seen. His son Beau James Duke Dragonfly will be in the show ring in 2012-and we are expecting great things from him as well. Tommy's show career was ended due to a veterinarian pulling adult teeth instead of puppy teeth. His impeccable pedigree includes such greats as his sire-CH. Petipom He Ain't No Saint who sired the top winning dog in Europe for 2 years running. 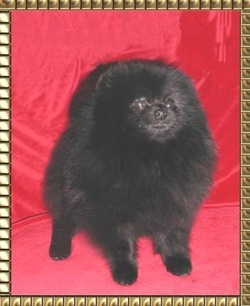 His grsire is the top-winning and producing black in Pomeranian history-BIS BISS CH. Finch's He Walks on Water HOF GC ROMS. 3 1/2 lb. Tommy is cast in their beautiful image. 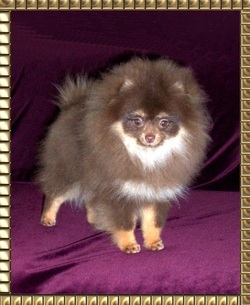 CH Gunner made Pomeranian breed history as the only solid color male to sire six consecutive parti-color Champions to finish his ROM title in addition to his Championship. His awesome pedigree is carried on by his beautiful parti-color and solid color children and gr children. CH Gunners sire is CH Chriscendo Call To Arms ROM - and his dam is Del Rey Revolutionary Star. This lovely orange parti-color Champion is the son of Champion Gunner. His contribution to our quality program has been immense and we are looking forward to his ROM title as well. His children are now being shown and are pointed already! Coalee is a full brother to Champion Elvis and was major pointed in limited showing when his owner became ill and did not finish his title. His daughters and gr daughters carry on in our breeding program with the beautiful Bonner quality. Galahad was shown and pointed although his show career was cut short due to his owners illness. He continues to add wonderful quality and structure with his beautiful white, cream sable and cream babies. 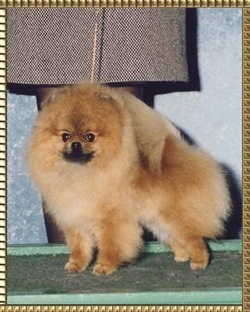 His fabulous pedigree goes back to famous English bloodlines on the sires side-imported from Canton Poms. Champion Indian Rock finished his title in 4 weekends total-the first weekend taking a 4 pt. major owner-handled-then a 2 pt. win when the major broke-and finally- taking two 5 point majors at the Michigan Pomeranian Specialty to finish his Championship with speed, grace and style! What an incredible little dog. His Champion sons and gr children are of amazing quality and personality. Champion Indy J is a son of Champion Indy-and carries the famous Millamor bloodlines. 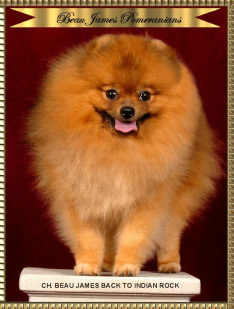 He is one of the premier sires of quality puppies available only through Posh Poms. His daughters are producing beautiful faces and huge, lush coats in many colors. He has several black & tan children so we look forward to his contribution with the beautiful black & tan colors. hasn't hit the show ring her children will represent her quality with their CH. titles. Topper has not been shown due to other commitments by his owner. We love this chocolate boy's structure, coat and style! His sons are carrying the beautiful Heartland bloodlines forward with their gorgeous puppies. Champion Teddy's gr children continue to add their beautiful faces and gorgeous black & tan color to the program. Nick has long been a top producing sire of quality and carries forward the lovely Heartland and Star Haven quality pedigree. Wyatt is being shown currently and is a son of Champion Remy. We are looking forward to his title and his puppies in the future. Treat is a foundation for incredible quality in chocolate and added the tan markings we love! Her children are carrying on in her awesome footsteps. Champion Dreamer is a son of Champion Indy. He finished quickly with BOB wins over top ranked specials. His Millamor and Bonner pedigree give us amazing coat and structure. His babies are an incredible addition to the beautiful coats and structure in our puppies. Doubloon is a son of Champion Teddy and has the sweet face, short back and bright tan marking pattern we love. His puppies are just as lovely and add so much to our program. Shiloh is an absolutely gorgeous blue merle & tan parti-color boy. His puppies have his beautiful face and high intelligence. He has sired several show quality merle babies. Shiloh is sire of Claudia Wallens foundation merles, and Kathie Inman's foundation male-Hemi. Hemi has sired many puppies that are making quite a stir with their beauty and soundness in the USA. We are looking forward to seeing the Pearl Moon Shiloh line recognized as one of the premier merle lines in the Untied States! Masters has a beautiful face to match his awesome pedigree. His background of whites and creams have helped us to have the gorgeous type and coats that his breeder is known for. We at Posh love the quality!